Proposals for affordable housing developments elicit predictable opposition, summed up in the familiar acronym, NIMBY—Not In My Back Yard—is the well-known shorthand for complaints about offensive land uses, offending architectural designs, and traffic disruption. While these concerns are sometimes justified, the discourse frequently veils one of the most pronounced reasons residents oppose affordable housing: fears that the presence of low-income households (and people of color) will increase crime rates, drive down property values, and fundamentally change the neighborhood’s character. Can affordable housing developers shift the NIMBY discourse by joining forces with market-rate developers of adjacent properties? A fascinating story of NIMBYism diffused in the Union Square neighborhood of Somerville, Mass., suggests they might. 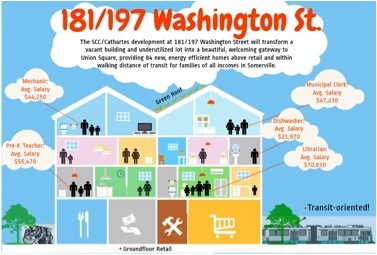 The Somerville Community Corporation (SCC) purchased the vacant Boys and Girls Club on Washington Street with the intention of building workforce rental housing in a rapidly appreciating town. The project is a particularly significant opportunity to advance the organization’s mission to preserve social and economic diversity in Somerville by creating homes within reach of working households. The three-story 1970s style building is located at the outer edge of the recently re-zoned neighborhood that will be home to a new station on the long-awaited extended subway line. According to the city’s vision, the neighborhood will become a bustling residential and commercial hub around that station. The rezoning included allowances for higher density, so SCC can build 40 units, many more than previous zoning permitted. They can also dedicate the ground-floor to the organization’s expanding programming as well as commercial space for future residents and frequenters of Union Square’s burgeoning establishments. What’s more, being one of the first to take advantage of the zoning changes is a proactive strategy to forestall the anticipated displacement of affordable housing as redevelopment progresses. Residents’ reactions to the proposal followed the typical NIMBY script. Proponents of the project welcomed the promise of retaining the neighborhood’s diversity. They also praised the transit-oriented design and proposed green building elements. But reservations about view obstructions, traffic congestion, and parking prompted expert studies and extensive community debate. Discussions about the low-income target population were by far the most contentious, even vicious. Opponents posited that the neighborhood already housed more than its share of subsidized rental housing. They argued that adding more low-cost housing would deter future development and have an adverse effect on property values. Opponents who voiced support of affordable housing insisted that a mixed-income model would be a more suitable alternative. Decreasing the number of units, extending the set-back lines, lowering the height, removing rooftop mechanicals, and other design modifications tempered the resistance but did not shift the debate. Last summer, shortly after one of the more contentious community meetings about the site, SCC began communicating with Cathartes Private Investments, the for-profit developer of the former funeral home next door to the Boys and Girls Club. The new zoning made the site an ideal location for the kind of market-rate housing and ground-floor commercial development Cathartes had successfully produced elsewhere in the region. However, its location on the major thoroughfare constrained parking options. An alliance with SCC would afford access to the perpendicular street and allow Cathartes to develop sufficient parking to accommodate several more units. Jointly designed parking would benefit the SCC project as well. More significantly, the alliance with Cathartes proved that affordable housing will not deter private development. In fact, developing the parcels at the same time would be an impressive jump start for redevelopment of the eastern gateway to the neighborhood. Taken together, the two projects form a defacto mixed-income development without reducing the number of affordable units SCC is able to provide. The two developers plan to adopt common design elements so that there are minimal differences between the affordable and market-rate developments. The fact that each contracts with the same property management company also promises to foster harmonious relations among residents of both complexes. The prospects of the coordinated development appear to be having an effect on the NIMBY discourse. The comments that followed the joint presentation of the proposal at last week’s Planning Board meeting were decidedly less abrasive. Though critiques about obstructed views and challenges to the traffic and parking studies we repeated, in contrast to previous meetings, no one argued against the number of affordable housing units. Indeed, endorsement of affordable housing prefaced each voice of opposition. It’s a modest shift in the NIMBY discourse. Even if the complaints do not prevent approval, the controversy may influence the implementation process. Nor is it clear what effect the defacto approach to mixed-income development will have on future neighbor relations among the residents of the two properties or in the broader community once they are occupied. It’s a modest form of partnership. The nonprofit and private developers opted for a narrowly tailored coordination instead of an agreement for joint development, ownership, or management of the properties. The independent status of the projects not only avoids the complexity of combining public and private funding streams, it also means that there was no reduction of the obligatory number of affordable units Cathartes must provide to satisfy inclusionary zoning requirements. It seems like joining forces with the developer of the property next door to a project facing a NIMBY battle is an experiment worth exploring. As one of the residents who will be affected by this proposed development, and having spoken with hundreds of my fellow neighbors, the project is still 100% opposed by the neighbors and residents of the area. What SCC has accomplished is to demonstrate that it’s objectives are in no way dissimilar from any other “for profit developer” which is simply to maximize the size and profitability of the development without regard to the surrounding neighborhood. Neither the for-profit developer Cathartes nor SCC has made any concessions to the neighbors. If there is a lesson to be learned here… it’s that people will always object to development when it’s too large and inappropriate for an area regardless of weather or not it’s market rate or low-income. Bad planning and development is just that… bad.